We share many things, my husband and I, but a taste for garlic is not one of them. This wasn’t always the case. In our beginnings, we spent countless romantic nights gazing into each other’s eyes over the greasy plastic tablecloths at Shawarma Palace. We planned our brilliant future together while taking turns dipping garlicy potatoes into a large shared bowl of creamy white, ridiculously potent, garlic dipping sauce. Then tragedy struck. Life happens. People change. A strong marriage must allow for personal evolution, even encourage it. On one of those Shawarma Palace nights I made a mistake, we got totally stoned and I got carried away in the moment. I went too far. I ate an entire bowl myself. The next morning I woke up gagging with the worst garlic hangover of all time. For the next three days all I could smell was garlic, no matter how many times I showered. All I could taste was garlic, no matter how many times I brushed my teeth, frantic and foaming at the mouth like I’d come home with a bad case of rabies – it sure felt terminal! Even now, just the idea of eating the stuff makes me nauseous. Once you’ve spent three days as a human garlic clove (sorry Robert Pattinson) any notion of it acting as a flavour ‘enhancer’ is long, long gone. Ever the gentleman, my husband stayed married to a woman who now loathes his favourite flavour. He’s good that way. I wanted to thank him for all the culinary compromises he’s had to make since then, and what better way than with the fetid plant itself? 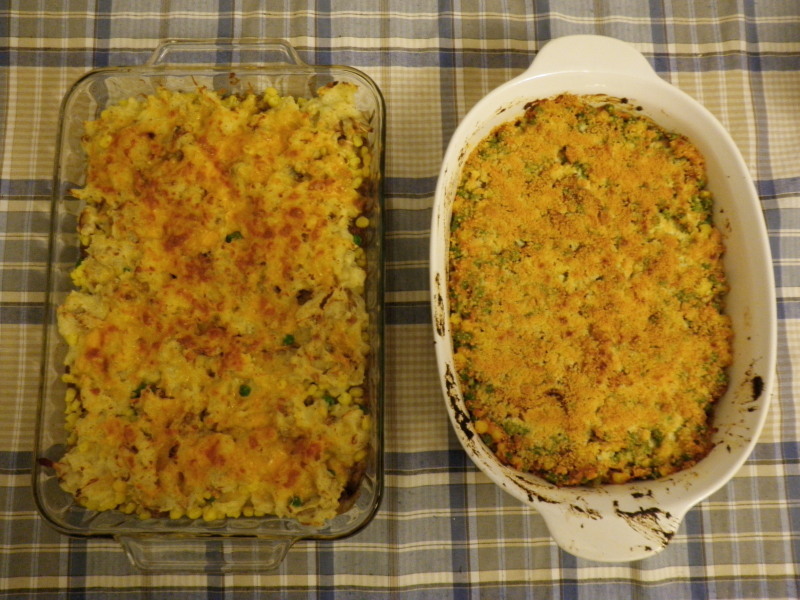 I ‘whipped’ up the two shepards pies you see above, and tailored them to our specific tastes. Mine was loaded with veggies and sweet potato, while his was all about garlicy mashed Yukon Golds. But how much garlic powder to add? Ah yes, that was the question. I will make any number of sacrifices for love: time, energy, even the occasional kidney; but testing garlic levels in mashed potatoes isn’t one of them. So instead, I took the logical approach and kept adding garlic until I could smell it. I have been informed by several garlicphiles since then, including my darling husband, that this is not how they do it at The Cordon Bleu. Apparently I got carried away again, because I added enough garlic to make the thing wholly inedible. And there it sat, on the bottom shelf of our fridge, as a Tupperwared token of misguided, misflavoured love, until Yesterday. It was harder than I thought it would be to throw out, and smellier, but I think there’s a lesson here under all the spoiled ground beef and onion. When you really love someone, and you want to tell them in a language they’ll understand, sometimes you have to be brave enough to taste it for yourself first. I took up golf didn’t I~wink. This entry was posted on Tuesday, October 13th, 2009 at 12:29 pm and is filed under Food. You can follow any responses to this entry through the RSS 2.0 feed. You can leave a response, or trackback from your own site. Thanks Michelle and Christina! I’m still in mourning over here lol. Although I did get a helpful snippet of advice in my inbox from a reader this morning: “Use a cookbook”… sigh…my sense of adventure just shook its head and laughed.